- We start with the previously released lettered preview: the Tetu/Changamire connection and the revolution of the Midnight Angels. - Ramonda is sent to talk to Changamire. They basically have a philosophical discussion about Wakanda. - We get a mild look into the backstory of Tetu which leads to a meeting between Tetu and the Midnight Angels. Both seem intend on taking down the King. There is also a mention of T'challa's superhero friends. However, there seems to be some scheming going on as Tetu brings up the massacre at the Mound and T'challa's first attack on Zenzi but does not mention they were the ones that caused it. - However, despite having a common 'enemy' and the fact Tetu offers his army to them, they do not join forces yet as the MA are being cautious. - T'challa and Ramonda talk about Changamire, who Ramonda believes is not a threat. We then get into a discussion of all the things T'challa failed at protecting Wakanda from (Doom, Namor, the Black Order) but also all the things he has fought to protect them (Gods and World Breakers) and what he has given up (including his marriage). - T'challa states he has given them everything, but Ramonda brings up that he feels like the people are Wakanda and the crown are a burden to him. That he needs to do more than protect, but to inspire. This leads to some sort of rally or celebration in the Golden City. - Tetu seemingly revives Zenzi or gets her out of the T'challa forced push coma she was in. - Tetu meets with a mysterious man who we come to find out is Zeke Stane. They talk about the upcoming revolution. Stane asks Tetu if he is ready for what revolution means... panic, fire, casualties, and agony. - The celebration in the Golden City is interrupted by explosions. Many are killed and injured... including Ramonda who would have died if not for T'challa vibranium suit. - This was by far the best issue of this first arc, despite being completely action-less. It was the most "even" issue with Ramonda, T'challa, Tetu, and the MA all getting important panel time, along with introducing another villain. It moved smoothly, had weight, once again perfect art, and it propels the book into arc #2. - The T'challa/Ramonda conversation was GOLD. Perfect on both sides. Said what a lot of BP fans have thought over the years. That while T'challa has excelled as King and protector... he has also failed. Hopefully that conversation will not only be a turning point for this book but for T'challa in the future. But, I thought the last good conversation between those two in #3 was great as well and it amounted to nothing lol. - This issue gave me hope, which is most important and may also be my downfall. The last page WAS T'challa. Surely, SURELY Coates cannot chump T'challa next issue after his mom almost got blown apart and after his statement on the last page. 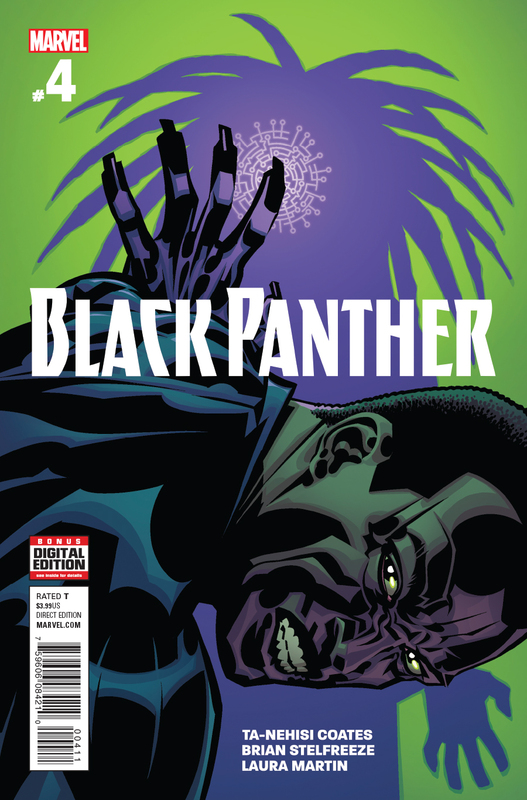 This is the PERFECT time for T'challa to start doing some damage in arc #2. - Changamire part was the biggest mistake of this issue. Would have rather had 3 pages of Shuri's story. I am curious if this will mean more later. - I saw red when I thought Ramonda had died. So glad he didn't cliff hang that scenario. - The potential Tetu/MA alliance is intriguing. Tetu is obviously playing them somewhat, not mentioning Zenzi and his role in the things. Will they join forces and then the MA will rejoin with T'challa near the end once his deception is known? Only time will tell. - Stane... I know nothing of Zeke Stane. He recently showed up in Thor last month as part of the "business Illuminati" thing and other than that... I got nothing. I read that he is a genius ala Stark, similar tech, is superhuman, and such. So, does he stand to profit if Tetu's revolution is successful? Does he have another motive? Is he just supplying tech to the highest bidder? - Not 100% sure what was going on with Zenzi. Looks like Tetu brought her out of her coma but then during the bombings, it looked like she was feeling their pain? gives me hope for the rest of the series. Now don't destroy that in issue #5 please.